The participants learn new action songs for children. The South Luzon District Christian Education Committee (SLD-CEC) conducted the 2017 Vacation Bible School Teachers’ Training last April 10 & 11 at the Lutheran Center in Sta. Mesa, Manila. Sunday School teachers and volunteers from churches under the SLD umbrella from Nueva Ecija in the North, to Batangas in the South attended the 2-day training. Total attendance reached 57, including pastors of the participating churches. 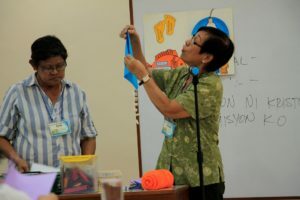 Mrs. Bella Jiloca (left) and Mrs. Thelma Quilala (right) facilitate one of the sessions in the training program. This year’s theme “Misyon ni Jesus, Misyon Ko,” centers on the transformed life of Peter from a simple fisherman called by Jesus to a brave missionary empowered by the Holy Spirit. The training aimed to equip teachers to teach children that they too can be powerful missionaries of Christ Jesus our Lord, young as they may be. Guys can be serious in doing projects too! Our future Pastors concentrate doing one of the activities in the training. As Biblical concepts were explained by the assigned SLD Pastors, the training also engaged the teachers’ experiences through actual demonstration of a regular VBS session. Pre-selected teachers were assigned a VBS day-topic to show the complete teaching process that contains the opening prayer, interpretation of Biblical concepts to children, application through songs and activities, and closing prayer. These teachers came from Immanuel Lutheran Church (Tugatog, Malabon), Bethel Lutheran Church (Tondo, Manila), Chi Rho Lutheran Church (Novaliches, QC), Christ the King Lutheran Church (GMA, Cavite), and Sola Gratia Lutheran Church (San Pedro, Laguna). Group processing immediately followed the teaching demonstration to reinforce teacher knowledge of Biblical concepts. Also included in the training was learning both new and traditional Sunday School songs. Each participant was given the Teacher’s Manual and a complete set of Activity Kit. Teacher Continuing Education in the SLD is spearheaded by the District’s Christian Education Committee composed of Rev. Henry Roa (SLD President), Mrs. Thelma Quilala (Christian Education Coordinator), Mrs. Bella Jiloca (Gloria Dei Christian School Principal), Rev. Ibarra Valeriano (Bethel Lutheran Church), Rev. Albert Callo and Mrs. Imelda Callo (Immanuel Lutheran Church), Rev. Daniel Pondevida (Trinity Lutheran Church), Delia del Rosario (Sola Gratia Lutheran Church) and Tita Dalida (Immanuel Lutheran Church). The Committee aims to develop more Christian Education training modules and activity manuals for LCP-SLD. The participants of the SLD Vacation Bible School Teachers Training 2017 ready to do God’s mission. Ms. Delia Del Rosario is a member of Sola Gratia Lutheran Church, San Pedro, Laguna and also serves in the SLD Christian Education Committee.